Watch our info-graphic on keeping social in later life. Older people in the community are vulnerable to being lonely and this can have a serious impact on health and well-being. Feelings of loneliness and being socially isolated affect our mood and appetite, which is another risk factor for malnutrition. 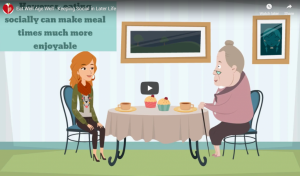 Our Keeping Social in Later Life video explains why it’s so important to keep connected and provides info on some helpful organisations in Scotland that aim to reduce loneliness in older people. If you have any enquiries regarding befriending projects or ways to keep social in later life then please contact us here. Next PostNext New Leaflet Available!